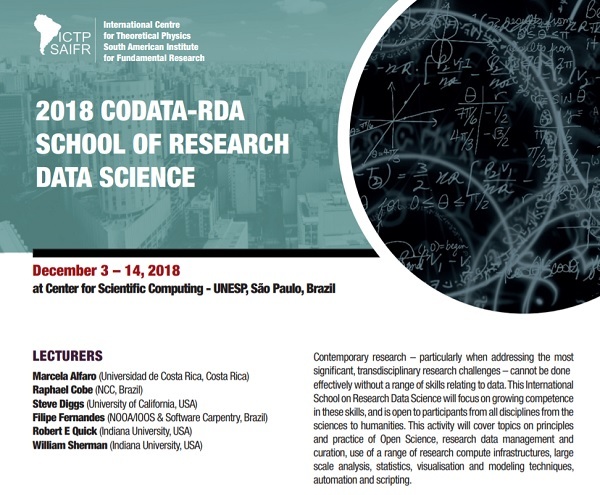 Applications are now open for the CODATA-RDA School of Research Data Science, Sao Paulo, which will take place at ICTP-SAIFR (ICTP South American Institute for Fundamental Research on 3-14 December 2018. APPLY HERE - the deadline for applications is 30 September 2018. There is no registration fee. Limited funds are available to support accommodation, subsistence and travel support. For financial reasons, it is likely that priority will be given to travel support for students from the Latin American and Caribbean region, except in the case of particularly exceptional students. The ever-accelerating volume and variety of data being generated is having a huge impact on a wide variety of research disciplines, from the sciences to the humanities. The international, collective ability to create, share and analyse vast quantities of data is having a profound, transformative effect. This ‘Data Revolution’ offers great opportunities for students with modern data skills, both in conducting their research and in entering a jobs market where those skills are in demand. ... growing competence in accessing, analyzing, visualising, and publishing data. It is open to participants from all disciplines and/or background from the sciences to humanities. This activity will cover topics on principles and practice of Open Science, research data management and curation, use of a range of research compute infrastructures, large scale analysis, statistics, visualisation and modeling techniques, automation and scripting. Applicants from any region are strongly encouraged to look for alternative sources of funding to support their participation. For the recent CODATA-RDA School of Research Data Science in Trieste a large number of students were able to support their participation with funding from a variety of sources including their institutions, various grants, charities and sponsoring organisations etc. The training provided by the CODATA-RDA School of Research Data Science is primarily targeted at Early Career Researchers (advanced masters students, doctoral candidates, post-docs and young or early career academics). The data skills taught are also useful for (data) librarians and other research support staff, such as those who envisage a career as data steward or data analysts. Furthermore, people who are more advanced in their careers who would like to improve their data skills as a form of continuing professional development are also eligible. how do they intend to use these skills? how will it benefit their research or the institution in which they work? Finally, candidates should take pains to ensure that their application is well supported by references from their past or present tutors or line managers. This is particularly important so that the School directors have confidence in the candidate and that the skills learnt will have the maximum benefit and impact.